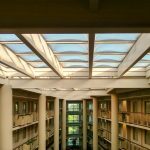 An Embassy Suites by Hilton Skylight Inspection and Certification. 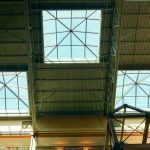 An onsite skylight survey and inspection was made on 6/8/2017 by Skylight Specialists, Inc., represented by Jon Kolenc. 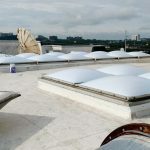 Atrium skylights – Skylight Manufacturer: Unknown. Twenty-six (26) 7’ wide x various lengths totaling 584 linear feet (nominal) acrylic, barrel vault, curb mount, original skylight. Glazing: Acrylic, white, dual glazed, not fall protected. 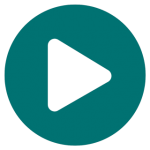 Anchors: Adequate anchor size and count around perimeter. Curbs: Adequate height and flashing in good shape. Evaluation: Exterior lens are cracked and need replaced. Expected Life Span: 1-3 years. 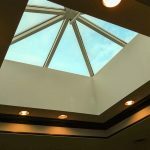 Recommendation: Because of this particular skylight frame design, we recommend that these skylights be re-built instead of replaced. Once rebuilt the life span would increase to 10-25 years. Many of the exterior lenses are cracked. Some are even missing large pieces of the outer lens. Cracked and broken skylights present a hazard to those beneath them. 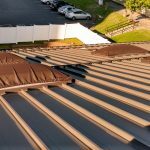 All outer acrylic lenses on all 26 skylights need to be replaced with new polycarbonate lenses and new gaskets and sealants. Total lens replacement is 96 panels plus two end walls have cracked exterior clear lenses. White inner lenses should be adequate. Access to perform work is acceptable. Cracks and missing panels as seen in the picture above leaves the skylights very susceptible to leaks and possible breach into the interior. These skylights are very unsafe in current condition and repairs should be performed as soon as possible.